Need help with #iMessage that is not working, showing errors, or having some trouble with iMessage activation on your #Apple iPhone 6s (#iPhone6s)? If so, then this content might be able to help. Read on to learn why iMessage will encounter errors or is not working as it should on your iPhone and what needs to be done in order to get it fixed. For starters, iMessage is a popular messaging platform patented by Apple for use on various types of iOS devices like iPhones and iPads. You can use Messages to send texts, photos, videos, and audio messages with your iPhone or other iDevices. With the latest iOS 10 platform, you can personalize your messages with animated effects, iMessages apps, and other cool new features within the Messages app. But that is if and only if everything works well with both the Messages app and the iMessage. Just like other apps, the Messages app might show some random errors or experience down times due to certain factors. During these times, you would encounter problems like unable to send or receive messages, cannot forward a message, or use any other features within the messaging application. And so you might ask, why do these things happen or what could possibly cause iMessage to encounter errors or problems on your iPhone 6s? There are many factors that can adversely affect the advanced messaging functions of your iPhone, including iMessage. Majority of the reported issues were tied to a network problem. In order to use iMessage, your iPhone has to have an active and stable Wi-Fi or cellular data connection. That being said, messaging features including iMessage will not work as it should with the presence of network problems like no connectivity. Network problems can occur for several reasons including account issues, scheduled network maintenance, network system outages, as well as improper network settings configuration on your device. In this case, you will need to deal with the transpiring network issue(s) first in order to get iMessage back up and running flawlessly on your iPhone 6s. Software glitches, corrupted apps or files can also cause problems to occur while using iMessage on your iPhone. This is usually the case when you happened to download or install new apps that contain some bugs or added some corrupted files or contents into your device. There are also other cases where users have encountered problems or errors with iMessage following an implementation of minor or major software update on their iPhone. Apparently in this case, the software update is to blame. Post-update issues including those affecting the iMessage functions on the iPhone can be rectified by some temporary workarounds while waiting for Apple to release an official fix patch. Meanwhile, some users who have encountered problems with iMessage activation as manifested with the ‘Waiting for activation’ prompt were able to fix it by correcting the date and time settings on their device. It turns out that incorrect date and time can hinder the completion of iMessage activation process. So if you are seeing the same alert message while attempting to activate iMessage on your iPhone 6s, you might as well consider checking the date and time settings and ensure that everything is configured correctly. In worst case scenarios, iMessage may not be working properly due to existing hardware problems on the iPhone. For example, if certain components on your iPhone 6s, particularly those parts that are responsible for keeping up the iPhone’s network functions are damaged. As a result, iPhone features that require network to function might as well be affected. You should consider seeking for professional aid especially if the symptoms started to show after an incident of dropping or exposure to liquid occurred on your device. There is a higher chance that your iPhone has accumulated some damage to certain components and thereby affecting its messaging functions. For iMessage problems or errors that are software-related, you can try performing some recommended workarounds and potential solutions enumerated below. Be sure to test iMessage on your iPhone 6s after completing each step to see if the problem is already fixed. Otherwise, proceed to the next applicable workaround(s) or solutions available. If necessary, update your iPhone to the latest version of iOS wirelessly or using iTunes. Software updates are offered to optimize device functions. The latest iOS version contains several enhancements to your iPhone features including iMessage. So in the case where some iMessage features are not properly working, a software upgrade might just be the thing you need. To check for available software updates, head over to your iPhone Settings-> General-> Software Update. Should you opt to continue and update your iPhone wirelessly, plug your device into power and connect to the Internet via Wi-Fi so as to proceed with the iOS download and installation. After updating iOS, check and see if iMessage is already working fine on your iPhone 6s. There are times when some features of your iPhone like the iMessage will not work properly as carrier settings needed some updates. To check and update your carrier settings on your iPhone 6s, head over to Settings-> General-> About, and then look next to Carrier section, to check the current version of carrier settings. You will also see an option to update your carrier settings if an update is available. Make sure your iPhone is connected to a Wi-Fi or cellular network to proceed with carriers settings update download and installation. In case you changed or inserted a new SIM card into your iPhone like when you switch between carriers, you would need to download the carrier settings for your new carrier. A cellular data or Wi-Fi connection is necessary for you to send a message as iMessage or MMS. Thus, you should ensure no connectivity problems are transpiring on your device beforehand. Otherwise, you will have to deal with the network issue so as to get iMessage working fine on your device afterwards. Also ensure that the type of message you are trying to send like MMS or SMS is supported by your carrier. In case you are attempting to send group MMS messages on your iPhone 6s, you will need to turn on the MMS Messaging feature or Group Messaging option on your iPhone. Contact your carrier if you are not seeing this option on your iPhone 6s. Sometimes, you won’t be able to send a message simply because the recipient’s details are incorrect or invalid. Errors and problems can occur while using iMessage due to incorrect set up of the iMessage feature on the phone. To check and ensure everything is properly set, go to your iPhone Settings-> Messages, and if necessary, toggle the iMessage switch to enable the feature. In order for iMessage to work properly, you also have to make sure that the Apple ID or phone number set up for your device is listed in the Send & Receive section on the Messages app settings. Navigate to Settings-> Messages-> Send & Receive. Tap the option to Use Your Apple ID for iMessage. If necessary, enter or select your current phone number and Apple ID under the You Can Be Reached By iMessage At section. Toggle the iMessage switch to disable or turn it off. Reset network settings by going to Settings-> General-> Reset-> Reset Network Settings. Please note though that this process will erase your current network settings including network password and other credentials. That being said, be sure to backup all essential information before you begin. Wait for the network settings reset to complete and then reboot your iPhone. Once everything is done with the network reset, go to Settings-> Messages, and then toggle the iMessage switch to enable it again. Perform a test message with iMessage and see what happens. Hopefully, you’ll get everything working with your iPhone 6s iMessage after completing the steps. 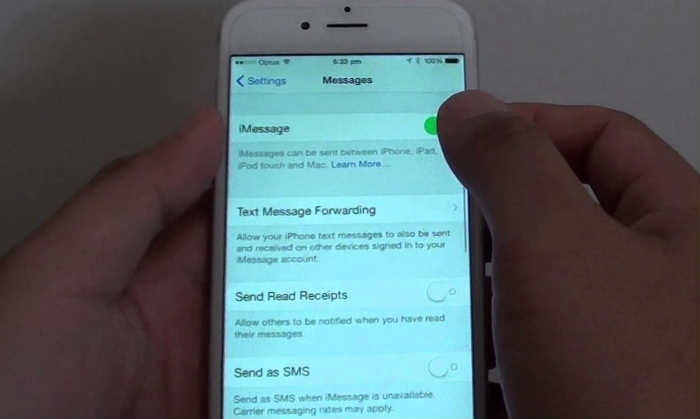 Below are potential solutions you can use to specific instances when iMessage issues occur on your iPhone 6s. Just select which methods are most likely applicable to your current situation. Turn on the option to Set Automatically. This will automatically set your date and time based on your time zone. Alternatively, you can change each setting instead of using the Set Automatically option. To do so, head over to Settings-> General-> Date & Time-> turn off Set Automatically-> change the time zone or date and time manually. To change the time zone, tap Time Zone and enter a city with the time zone that you need. To change the date and time on your iPhone 6s, tap the date icon. To check if your iPhone is showing the correct time zone, head over to Settings-> General-> Date & Time-> Time Zone menu. Manual adjustments to time settings to change app behaviour like game timers are not recommended. On the Message screen, toggle the iMessage switch to turn it OFF and then back ON. Now create a test message using iMessage to see if it is already working fine. Otherwise, try other applicable solutions. Tap on the red exclamation point. Tap the option to Try Again. Wait for your iPhone to resend the message. If you still cannot send the message, tap the red exclamation point again, and then tap the option to Send as Text Message instead. Please note though that selecting this option may cost you some extra messaging rates. For more information, contact your carrier first. Locate the conversation or group conversation you want to delete. Swipe left over the desired conversation, and then tap the option to Delete. Once the conversation has been deleted, start a new one. Enter the phone number or email addresses of your contacts (recipients). Compose a new message and then tap Send. You will no longer be able to recover a conversation once you have deleted it. That being said, you can take a screenshot of the parts of a conversation you want to save. To save an attachment in a conversation, touch and hold the attachment, tap More, and then tap Save. Navigate to Settings-> General-> Keyboard menus of your iPhone 6s. Tap the option to Add New Keyboard. Tap Emoji to enable emoji keyboard on your iPhone. Now open the Messages app and see if the emoji keyboard is already available. If you keep getting unwanted iMessages on your iPhone 6s, blocking the sender’s phone number or filtering messages on your iPhone can help. Your iPhone’s iOS allows you to block unwanted contacts and phone numbers as well as filter iMessages from unknown senders. You can also report iMessages that look like spam or junk, whenever needed. Blocking a phone number or contact will not affect the entire voicemail function of your iPhone. This denotes that the person you blocked can still leave a voicemail but you won’t get a notification. Messages will not be delivered and the contact will also not receive a notification that the call or message was blocked. Scroll to and toggle the switch next to Filter Unknown Senders. After that, you will see a new tab for Unknown Senders in Messages but you won’t get notifications for these iMessages. If none of these methods is able to fix your iPhone 6s iMessage problem or errors, then it’s time to contact your carrier or Apple Support to escalate the problem and seek further support or other recommendations.